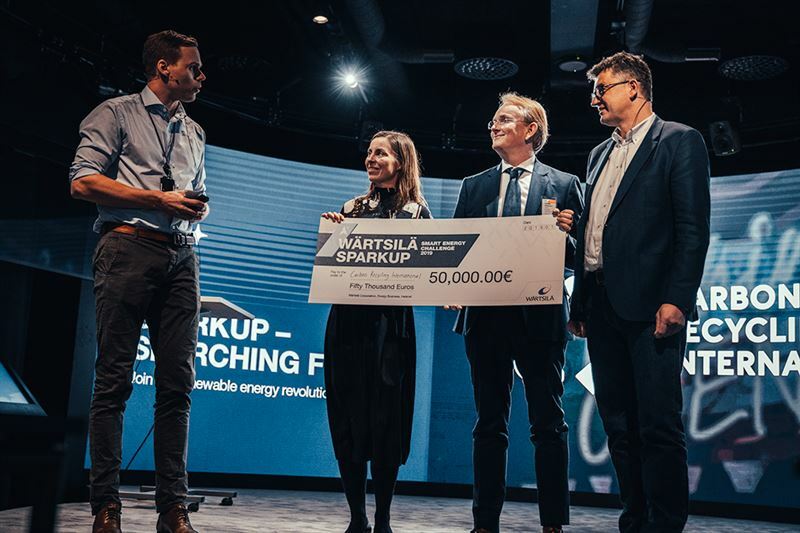 The technology group Wärtsilä awards Icelandic Carbon Recycling International as the winner of the SparkUp Energy Challenge. For the first time the focus of this start-up challenge was on the energy field, on Power-to-X technologies. “The real winner of this challenge is actually Wärtsilä. We get the opportunity to collaborate and work with these growth companies. Power-to-X is the missing piece of the puzzle when we are going towards 100% renewable energy systems. The winning company has experience on the whole process of Power-to-X from end to end, and we have a lot to learn from each other,” says Matti Rautkivi, Director Business Development at Wärtsilä Energy Business. The idea behind Carbon Recycling International’s solution is to take CO2 and hydrogen made with renewable power and turn these components into synthetic methanol. The winner was selected by a jury consisting of Wärtsilä’s own and external energy specialists at the SparkUp Challenge Day, which was held at Wärtsilä Campus in Helsinki on 17 January. The four finalists, Carbon Recycling International, Green Hydrogen, Sunfire and Climeworks, were chosen from a shortlist of 14 start-ups, which were screened and evaluated based on their ability to complement Wärtsilä’s Smart Energy Vision. Altogether close to 70 companies entered the challenge from across the globe. The jury focused on three criteria in choosing the winner: the team and its knowledge, the solution and technology as well as the readiness to collaborate with Wärtsilä. “The finalists are actually scale-ups rather than start-ups as they are reasonable size and already in business. Some of them even have their own power plants in operation. They are looking for a serious partnership,” enthuses Steffen Knodt, Director Digital Ventures, Wärtsilä. The winner gets to collaborate and co-create with Wärtsilä energy experts. In addition, they will receive a capital grant of 50,000 euros. “We believe our synergies with Wärtsilä are strong and we can build our partnership on that. To realise Wärtsilä’s long-term vision, we need to get the message through that a 100% renewable future is possible and we need to do it together,” believes Margret O. Asgeirsdottir, the CFO at Carbon Recycling International. The Smart Energy Challenge was based on Wärtsilä Energy Business’ vision: ‘Towards a 100% renewable energy future’. Wärtsilä is determined to lead the path in providing power systems based on 100% renewable energy. The renewable energy generation is driven by weather and sometimes more energy is created than needed. Electricity can then either be stored or used in other processes. Power-to-X process is all about this. In the future, the excess renewable energy can be seen as raw material for other commodities. Wärtsilä was searching for start-ups to share solutions in the areas of Power-to-Gas, Power-to-Fuel and Power-to-Water.